Park City Utah is home to world-famous ski fields, Sundance Festival, and the US Ski Team. But come summer time, Park City is the adult playground you never knew you needed in your life. From quaint Main Street, bursting with everything from flowers to exceptional cuisine, to Olympic Park that even grown-ups will have a hard time leaving. The saying goes, everyone comes for the winter and stays for the summer. Summer in Park City offers fresh air, a few thrills and long adventure-filled days. After five days on the road around Utah, a view from the top is quite a way to end it. What a view. 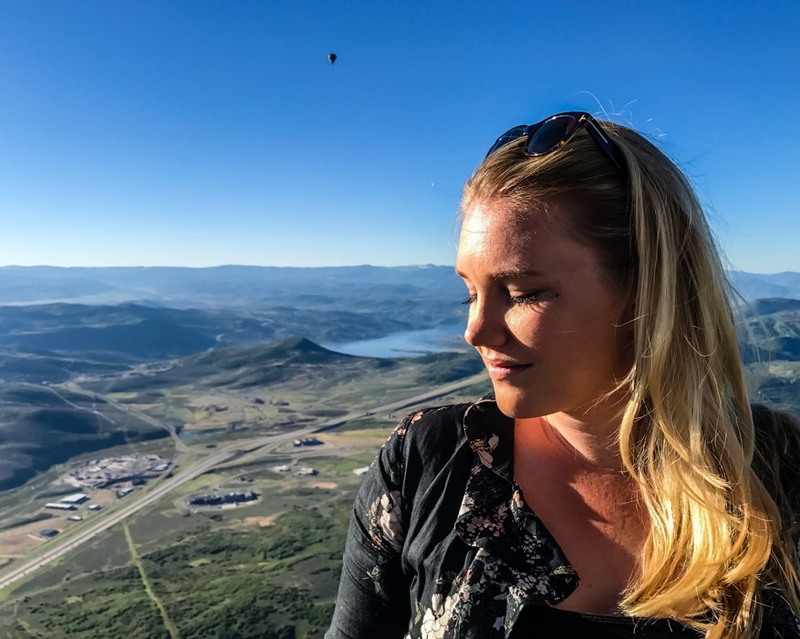 Park City Balloon Adventures provide transportation to and from the launch and landing site (you will never know the landing site until you physically land) where you will celebrate at the end of your journey with a champagne toast. The tranquil climb is a surreal feeling and surprisingly quite smooth. If you are not the biggest fan of heights, just set your gaze forward, not down. You might find yourself having a ‘cartoon eyes popping out of your head’ moment. With a handful of shops, cafes and a museum to meander around, even if you’ve got one day in Park City Utah, you’ll likely find yourself in Main St, in the heart of the city. Head back after dinner and see the streets lit up at night and pop into No Name Saloon, a favourite with the locals and the most Americana bar you will ever see. If you can tear yourself away from the beautiful street for an hour or two, the Park City Museum explains the mining history and how Sundance was founded. Don’t forget to check out the original jail cell in the basement. Everyone needs a little retail therapy especially if it’s at a discount. Tanger Outlet is big enough to spend a couple of hours ducking in and out of shops, but small enough to be back on the bike trails before lunch. Head over to Park City’s newest craft distillery and sit down for a taste test with Rob Sergent, the owner of Alpine Distilling. The rustic shop has old photographs on the walls which one would assume are from a thrift shop for decoration. Sargent explains he discovered his family history in grain production dating back to his great-grandmother, a full blood Cherokee Indian. The photographs on the walls are all of his ancestors. All the drinks have amazing aromas and go down very smoothly. Even the non-whisky drinkers will become fans. Known as the best restaurant in town, this place may not stand out from the street but stands out on a culinary level. The large open dining room with exposed wood beans was light and airy. As the sun streamed in, live music from the piano and singer echoed through the room. The menu, by Chef Seth Adams, samples traditional American fare with a fresh food twist. Dinner starts with amuse bouche, a small bite sized taster before the meal as a complimentary glimpse into the chef’s approach. The Macadamia Nut Crusted Alaskan Halibut is widely popular, as well as the Trio of Wild Game which includes Buffalo, Venison, and Elk. Riverhorse also offers a full Vegan and Gluten Free menu. Park City culinary options are excellent in terms of fresh delicious meals and Versante Hearth + Bar is no exception. From fragrant cocktails to heavenly salads and the most decadent mac and cheese, Versante offers something for the whole table. In the newly renovated Peaks Hotel, this isn’t just another hotel restaurant, but rather a destination in itself in Park City. The Summer Steak Salad blows the typical boring salad option out of the water and comes served on a big wooden board. Beware: you must leave room for the French Toast Bites. They are melt-in-your-mouth decadent. The cutest rustic counter-service café, perfect for a bite to eat after say a morning in the sky in a hot air balloon. Vessel delivers a farm fresh menu using locally sourced ingredients in a casual dining atmosphere and a focus on providing a healthier lifestyle through food. The brunch bowls are a nice change from the traditional bacon and eggs brunch order. Mountain Bowl comes with two eggs, sweet potato hash, braised beef, summer greens, fresno aioli and sourdough toast. The brunch is light, yet completely satisfying. After a multi-million dollar renovation, Peaks Hotel is the place to stay in Park City for lovers of mid- century modern après living, one of a kind pool facilities and exceptional dining. After a long day of hiking or tackling the ski fields, the rooms at Peaks Hotel are the perfect place to retreat for a little R&R. With a modern, sleek, luxurious shower or a cloud-like bed, you forget why you even came to Park City. If relaxing by a pool is your thing, take a dip in the sparkling new pool that is a winner with both kids and adults. Going from the outdoor to indoor pool requires no more than a paddle through the threshold. Then soak those muscles in your choice of the hot tub, dry sauna or steam room. The Fit Traveller was a guest of Visit Utah for this trip. As always, the opinions, words and images are authentically our own. « Is Sumba Island Indonesia’s Best Kept Secret?